In this busy world, our experiences of happiness are fleeting and short-lived, while inner peace eludes us completely. We want happiness and freedom from problems, but problems keep coming. This series of classes will be based on the book, The How To Solve Our Human Problems, a practical manual on Buddha’s popular teaching on the Four Noble Truths. 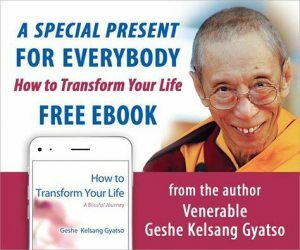 Through teachings and guided meditations, Gen Kelsang Gomlam will help us learn practical methods we can use right now to bring about the positive and lasting changes we long for. Drop in for a class or try the whole series! Classes are stand-alone in nature, and include teachings, guided meditations, as well as a chance to discuss & ask questions. They are followed by refreshments in our beautiful community room. The Kids’ Class is held simultaneously in the smaller meditation room, so Sunday mornings are a great opportunity for families to come to the Center. No previous experience necessary- drop in anytime. Everyone welcome! Cost: $10/Class or Free for GP/FP Members and Benefactors or Sign up for a monthly series and save!